A motorcyclist was seriously injured in a collision which happened as police were responding to an emergency call. Officers in a police van were responding to a "grade one" call for concern for the welfare of a person - the highest graded response for emergency calls - at around 10.05pm on Saturday in Leigh. As the van approached the traffic lights on Twist Lane, at the junction with Atherleigh Way, a white off-road motorcycle was involved in a collision with a blue Audi A3, which was travelling through the junction. The officers in the van stopped and spoke to the driver of the Audi and an ambulance was called. The motorcyclist - a man in his 20s - was taken to hospital, where he remains for treatment to serious head and leg injuries. His family has been informed and is at the hospital with him. No arrests have been made and police are appealing for dash-cam footage and sightings of the motorcycle prior to the collision. PC Pete Cunningham, of Greater Manchester Police's serious collision investigation unit, said: “We remained at the scene for a number of hours overnight but all roads are now fully reopened and we’re continuing to piece together the events leading up to the collision. 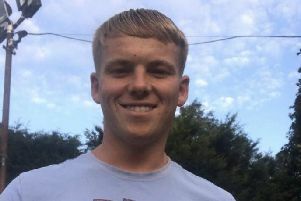 “We’re particularly interested in speaking to anyone who saw the motorcycle in the Leigh area that evening – by speaking to you, we may be able to build a fuller picture of what has exactly happened so we’re able to progress with our investigation. Anyone with information is asked to contact the serious collision investigation unit on 0161 856 4741, quoting reference 2289 of August 4, or Crimestoppers, anonymously, on 0800 555 111.